Being able to tutor for a combo piece is good, letting your teammate tutor is even better. It’s impossible to talked about Virtus the Veiled without mentioning Gorm the Great. Simply put, Gorm lures all the blockers so Virtus can halve your opponents life. This is fun, if not a bit convoluted. There are plenty of other ways to give Virtus evasion, Tetsuko Umezawa for example. In true assassin fashion this Azra is very frail. 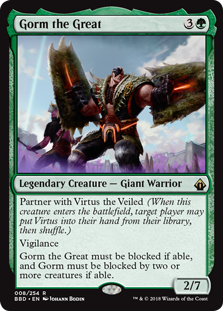 I can see a theme deck with Quietus Spike and Wound Reflection would be fun to play, but I feel Virtus is to frail to survive long in multiplayer, even 2-Headed Giant. And so we now get to Battlebond‘s other unique mechanic, Partner, which allows you to let a player dig this creature’s ally out of their deck. This means it’s ideal for Two-Headed Giant, but it can function outside of the format. 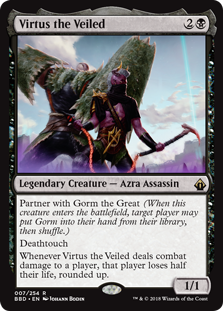 And Virtus pairs very well with Gorm, his friend; Gorm forces blocks, and Virtus punishes a lack of blockers. It’s extremely unlikely Virtus will get in without some manner of resistance, as the Quietus Spike effect is quite potent, even on a 1/1 body. I think Virtus (and paired with Gorm) is certainly too slow for Constructed, as it has no protection and a puny body, but it’ll be a casual format star.